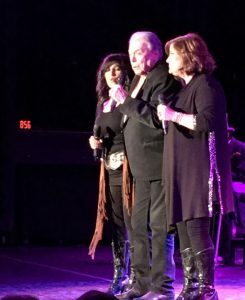 LAUGHLIN–When I learned that the Riverside Resort Casino was having an “Urban Cowboy” Reunion starring Country music legends Mickey Gilley and Johnny Lee, I, of course had to saddle up and go. Not only because I was one of their big fans back in the hoot-hollerin’ honkytonk days, but because I had been in Los Angeles in 1980 working and looking for love. After dating a few non-descript men including two who were vying for an acting career, I met and fell in love with my husband. Of course, Johnny Lee’s number one song, “Looking For Love” would become ours. In the early 90’s, single and now with my young daughter, I would again be bitten by the Urban Cowboy phase when Don Laughlin had country western dance nights at the Riverside. Memories are sketchy, but I do remember meeting Mr. Laughlin as he sat at “his” table one night, perfectly groomed in one of his classic leisure suits observing a packed house full of country music fans and line-dancers in their Wranglers and Stetson hats. Fast forward to Sunday night. When I returned to the Riverside’s Don’s Celebrity Theater this time, I noticed that the once magnificent dinner theater was no more. I began to ball up at the memories of the late grandure and ambiance that had once graced this iconic dinner-theater. And now, watching my own daughter with her own child, almost the same age as back then, I almost lost it. Sunday night would be a walk down memory lane for me. I would be listening to two of the top Country solo-artists from that time. 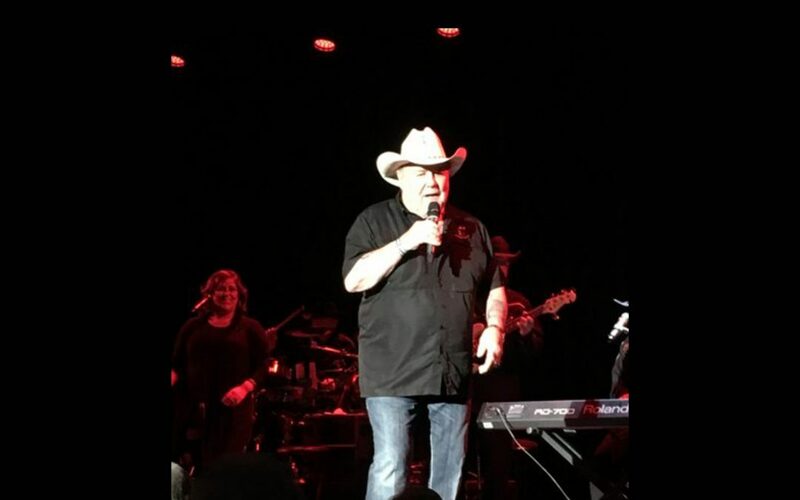 Johnny Lee, now 71, is no worse for wear except for what he says are sore ankles, and never missed a beat while he belted out some of his favorite hits. Jokester, comedian, and singer, Lee put on a great show. He and Mickey Gilley played to sell out crowds each night they had appeared at the Riverside to perform. Johnny had five hit songs that made the top of Billboard Magazine and his hit single, “Looking For Love” topped the Country Billboard for three weeks and catapulted him to fame after appearing and singing in the box-office hit, “Urban Cowboy.” Mind you, there is nothing “urban” about either of these lovin’, ridin’, singin’ cowboys. They are the real thing and if you listen closely, many of their songs pay homage to their true lives. Lee’s other claim-to-fame was a brief marriage to Charlene Tilton of “Dallas” television fame. He was affectionate about voicing his memories of her, which drew large laughs from the packed house, many doning his face or Mickey Gilley’s on t-shirts and many who had been fans from the git-go of the Urban Cowboy days. What could possibly be said about the incomparable Mickey Gilley that hasn’t already been said or talked about. Lee is a freewheeling cowboy, singer, and of course, his claim-to-fame co-ownership of his namesake honky-tonk bar almost single-handedly launched the Urban Cowboy movement. But Sunday night it was all about the Riverside and the fans who came to see Gilley and Lee do a medley of their favorite hits. Gilley had been largely instrumental in launching the Urban Cowboy phase when he built the famous Gilley’s outside Houston, Texas in 1971 that hosted men who just came off the oil fields and rigs; celebraties, and regular loyal fans who would go just to blow-off steam, down a few beers, ride the mechanical ball and yes, fall in love. It was all there for the asking. But it was Gilley’s smooth, sensual almost crooning-like voice that captivated his many fans. Sadly, in 1991 the original Gilley’s burned to the ground. Arson was suspected, but like the Phoenix, Gilley rose from the ashes and a new Gilley’s was later built outside Dallas, where fans still flock to to this day. No doubt, it was Johnny Lee and Mickey Gilley who had changed the landscape of country music forever. While the night was winding down, I met the man himself, Mr. Don Laughlin in the hallway after he had momentarily stepped in and out of his theater. Sprinting, I caught up with him in time to shoo away a heckler trying to take his photo. I told him how much I enjoyed coming to the Riverside with my young daughter over the years and that I’d done several stories on him and the “Urban Cowboy” phase he’d almost single-handedly brought to the Laughlin area back then. Got an event or venue to cover? Let me know. Email me at azswriteon@hotmail.com or call 928-763-3072.